A body and card draw for two mana? This feels like it should be a rare… Barely, but I think it could. No, god, that would be obnoxious as heck if it was. 1. We don’t need “lol limited” to be a useless argument for rarities like it usually is (for gods sakes people would use limited as an argument if WOTC printed a rare five mana 4/1). If you can explain why it would be too good in limited, that’s one thing. 2. It’s a reprint of an overpriced uncommon. 3. Additionally, card draw on a two mana body is typical. 5. This is only effective in a Merfolk deck. In limited, would to open one rare menfolk with this ability? No. A rare, tribal limited card (or many races that are only useful based on specific synergy) should be powerful and explosive enough to warp your deck around it. Near the beginning of draft picking, you’d be willing to lock yourself in menfolk for Master of the Pearl Tridnet, because it can win the game. Even if you don’t find any menfolk, going mono blue, it’s a fine filler bear. This would just be dead in a non Merfolk deck. This won’t really close out the game or swing one MASSIVELY in your favor. This is just a very powerful creature comes closer to a win. If this closes out a game, it was pretty tight. 7. I thin seeing a bunch of these guys limited would be pretty tough and would make a limited deck with Merfolk viable. 8. A quasi green version of this card was printed recently at either a common or uncommon. Silvergill has always been the better of the two. Clearly – No debate. Not to mention that Merfolk has also always been the better of the two tribes in Modern. Elves has never been higher than T2 Merfolk has always been frequently Top 8’ing since Modern’s inception. The extra power means a LOT. 1 extra power means Silvergill not only kills your opponent twice as fast, it trades with better creatures. Also, Visionary sees no other play besides Elves. So saying it can be played elsewhere doesn’t matter when comparing it to Silvergill, because it isn’t. Silvergill is only played in Merfolk. Visionary is only played in Elves. Visionary being “playable” outside of Elves is not the case, if literally only Elves plays it. That’s the entire point of tribal synergy. Just like Visionary is only effective in an Elf deck that can actually do something with a worthless 1/1 body, like tap it for mana the turn you play it thanks to Harbinger – or pump it with a lord. Comparing Visionary to Silvergill isn’t appropriate. Crossing the color pie, you would end up with something more like Think Twice than a creature, unless Visionary is being played in an Elf tribal deck. Alright, God Emperor Zombie, your word is law. Except it isn’t. It is possible to think about it outside of a competitive scene, I mean mechanically speaking, Elvish Visionary is a more powerful card because it can technically be used outside of an Elf deck as a 2 mana 1/1 while Silvergill is an additional three mana outside of its respective tribe. As you mentioned, Merfolk is the more powerful tribe. Doesn’t mean that Silvergill is the more powerful card, just has better support. If you were to switch the two creature’s subtypes, then you’d see Merfolk Visionary in vintage and Silverleaf mostly in modern/sometimes legacy. What you say about the extra power is true, but the innate flexibility of the Elvish Visionary NOT being completely tribal restricted makes it better in a vaccuum. 5 mana 2/1 cantrip or 2 mana 1/1 cantrip? But most importantly, my initial point still stands. Zombie, wouldn’t it be crummy if this was reprinted as a rare? How about they both are good in there own deck, but visionary is slightly more playable in a non-trible, while adept is far better in a merfolk deck. Visionary isn’t ‘ playable’ outside its tribe, though. It’s only played successfully in Elves in constructed. Not to mention wherever Visionary is in draft, there are other Elves to make it worth it. 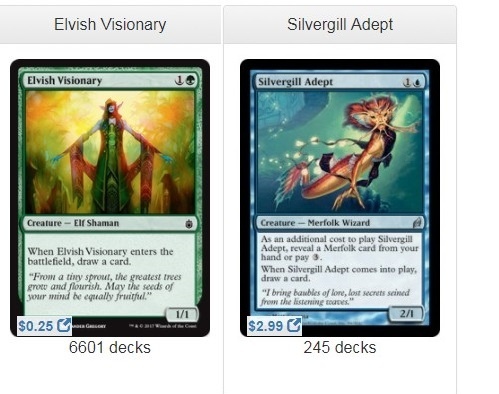 Silvergill is only played in Merfolk, Visionary is only played in Elves. or quibble about your strictly competitive perspective, dats cool, too. So your argument for the card is using the format where nearly literally everything, even the some of the worst cards ever printed are playable? Setting the bar so low that you can make any argument for anything. Bold strategy. Side note: EDH isn’t the most played constructed format. It’s just popular. Standard and Modern still have a larger playerbase. EDH just has more casual appeal, doesn’t mean it has more players. Merfolk’s also not supported enough for a singleton format to be that popular. Elves is. Merfolk is also played less in Non-EDH Singleton formats than Elves. Naturally Silvergill will be played less where Merfolk is played less. Silvergill is still the better card. And Elves takes up the vast majority of Visionary’s play percentage in EDH. Not to mention EDH analytics include literally every deck possible that fits their parameters, including decks that are absolute hot garbage. Adept as a rare would be entirely fine, it just wouldn’t help the price as much. They already reprinted a $15- 20 uncommon in Amonkhet called Aven Mindcensor at rare, and that worked out perfectly. Adept at Rare would just mean tribal Merfolk in a RIX/RIX/IXA draft sees maybe 1 instead of maybe 2. It’s not like Merfolk is desperately clawing for card advantage anyway. Hey tbf Rally the Ancestors played Visionary in standard, and would definitely not have played Adept if it were around. It’s almost like the vast majority of Rally decks didn’t use Blue. Being one of the worst cards in a deck doesn’t make something good. I can gaurantee you if there was support for a decent blue Rally deck and Silvergill was legal, it would see play over Visionary 100% of the time. Beware, ye who tread further. I love the reprint!… kind of wish the flavour text had some… flavour in it. Yeah doesn’t really fit the flavor of merfolk from what we know of Ixalan so far too, it’s possible that rivals of Ixalan does change the nature of the merfolk tribe where they take to the oceans rather than staying mostly in the streams. Oh, I’m getting you. You know what, you bring up a strong point that might add more flavour! The text seems really generically Merfolk “look in the ocean: there are secrets!” Woah, hold on… the aquatic-based creatures know about aquatic locations? But as you said, Ixalan Merfolk have an affinity for rivers and waterways rather than the ocean itself. I bet there’s a whole thing with Kumena changing the ‘old ways’ of the Merfolk, as they are seen as traditionalists, and encouraging Merfolk to go through the oceans instead. Thanks, man! That sold me! Mayhaps a merfolk deck can actually see play in standard once rivals drops, Kopala is fine, this plus branchwalker makes the two drop slot fairly exciting, and kumena’s speaker could definitely be okay, just need more filler for more support. I hope this means that all the four tribes will get more powerful tribal payoff cards (especially dinosaurs and pirates, vampires are already strong enough in commander).